To look at a final score of 13-4, you wouldn’t think that the Reds trailed almost the entire game. The Cardinals took a 0-2 lead at their very first opportunity, and the Reds didn’t manage to tie it up at 4s until the 8th. And then, lo, the 9-inning 9th. That was really something to see. Shin-Soo Choo was the big story, having committed both of the team’s 2 errors that allowed 3 runs. But then he also led the team in RBI this game with 3, so it was a wash. Jay Bruce went 4-for-5 with a walk, an RBI, and 2 runs scored. Brandon Phillips got booed a lot and also hit a home run. Joey Votto went 1-for-4 with 2 walks, an RBI, and 2 runs scored. He’s certainly not looking like his old self, but I bet it messes with your pitch-o-vision to see so many balls go by. This game was too massive to be properly covered in brief, so I recommend you go check out the game wrap. You mean we get to do this again?? Bronson Arroyo (RHP, 1-0, 4.50 ERA) will take his turn for the Reds against Lance Lynn (RHP, 0-0, 9.00 ERA). Lynn lost a bunch of weight over the off-season and is adjusting to his new slenderness. Arroyo, on the other hand, has always had the body of a 15-year old boy. First pitch at 8:15 p.m.
Major League Baseball and PEOPLE magazine today announced the “Tribute for Heroes” campaign, a national initiative that recognizes veterans and military service members and builds upon both organizations’ commitment to honoring our country’s heroes. Beginning today and running through May 17th, fans are encouraged to visit TributeforHeroes.com to nominate an active or former member of the Armed Forces of the United States or Canada for the chance to represent their favorite MLB team at the 2013 All-Star Game. Once all the nominations are reviewed, three veterans/military service members per Club (90 finalists) will be selected by MLB, PEOPLE, and a celebrity panel of judges, who will be announced at a later date. Fans will then be encouraged to vote online from June 9th through June 30th for their Club favorite. All 30 winners, one representing each MLB Club, will be announced on July 10th. They will be included in All-Star Week festivities and recognized during the All-Star pre-game ceremony leading up to the 2013 All-Star Game at Citi Field on July 16th on FOX. A “Tribute for Heroes” winner will be featured in PEOPLE magazine the week of the MLB All-Star Game. The “Tribute For Heroes” campaign will support Welcome Back Veterans (welcomebackveterans.org, powered by MLB.com), an initiative of Major League Baseball and the Robert R. McCormick Foundation, which addresses the needs of veterans after they return from service. Shin-Soo Choo committed only 2 errors in all of last year when he was playing right field. 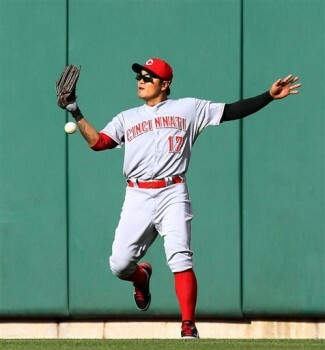 Shin-Soo Choo drops a fly ball in center field against the Cardinals. It took a while for them to go, but when the 9th inning came yesterday in a tie game, my, how the Cincinnati Reds went. Through the majority of the game, it wasn’t looking like it was the Reds’ day. Starter Mat Latos pitched well in his second start, continuing to make progress in erasing his history of poor Aprils, but Cincinnati was lacking on defense and offense. In particular, new center fielder Shin-Soo Choo had problems with the sun, dropping two balls and allowing 3 unearned Cardinals runs to score. With the way Jaime Garcia was striking out Reds batters, it seemed like that would be enough. But the Reds kept staying close. Then in the 8th inning, pinch-hitter Xavier Paul singled into right field to score Jay Bruce and tie the game at 4. The game felt like it was starting to turn to favor the Reds. And then the 9th inning happened. It started with a walk to Shin-Soo Choo. After getting Chris Heisey to pop out, everything fell apart for the Cardinals and their closer Mitchell Boggs. Joey Votto was intentionally walked, allowing Brandon Phillips to come to the plate and double in the go-ahead run. A lead was all I was hoping for. What came next was a comedy of errors and ineptitude rarely displayed by a St. Louis ball club. 12 more batters went to the plate, and the Reds scored a total of 9 runs in the inning. Choo started everything with a walk, and in his second at-bat of the inning, he erased those 3 unearned runs he’d allowed by crushing a double that cleared the loaded bases. All in all, it was a fun game. The Reds have faced nothing but good, playoff-contending teams to start the season, yet they sit atop the standings in first place with a 2 game lead on the Cardinals. Posted in Cincinnati Reds, Game Wrap, NL Central, St. Louis Cardinals.